A lost drone is every pilot's worst nightmare. And rightly so. First up, hundreds - or potentially thousands - of dollars' worth of equipment has suddenly gone missing. And on top of that, you've lost all the raw footage that's saved to your drone's internal memory. There's also the small detail of not knowing where, into what or onto who your quad has landed. So what can you do about your lost drone? And how can you stop it from going missing in the first place? Losing track of your drone might happen for a number of reasons. Determining which of these has happened is your first step towards finding it. First, your connection could have dropped out. This may have stopped your controls from getting through or disabled the live feed from your camera. 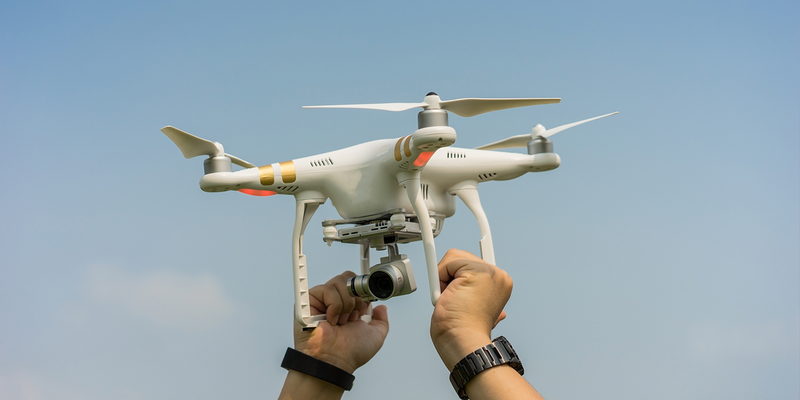 Either of these can quickly end in a crash, so try to determine in which direction you were flying and if there are any obvious obstacles the drone might have hit before coming down to earth with a bang. If it has dropped, you should be able to see your drone's location on whichever app you are using. But this GPS marker will only last as long as your drone's battery life. Plenty of the latest drones on the market have features to stop the lost drone issue from happening. Depending on your settings, a loss in connection could make the drone hover in place or return to your home point. Lost connection to your controls or your live feed? It could be that your drone isn't flying off into the distance, but just heading autonomously back its starting point - Providing you've set up the RTH function properly. The second reason you might end up with a lost drone is that a fault or interference has caused it to simply fly away. If this happens, try to locate your drone using the app and the location marker. The next thing you should do is upload your flight logs to the manufacturer in question. In the case of an error, they will be able to detect a fault from the logs and may provide you with a refund or a replacement drone. The final way you might end up with a lost drone is if you have an accident somewhere where it's difficult or impossible to recover it. Examples of this would be a dense forest, a lake or (gulp) the open ocean. This is as bad as it gets. You know roughly where it is but the terrain makes it tough to recover. Most manufacturers will only replace or repair drones under warranty once you send them what's left of yours, so the only option is to search high and low for remains. Hiring scuba gear, printing some 'Have You Seen This Drone' posters and getting familiar with a metal detector are all potential options at this point. There are a few things you can do to make a lost drone a.) impossible or b.) a lot less likely. First, you should consider buying a GPS tracker. Although most drones have GPS built-in they vary in accuracy and only last as long as your battery life. Recovery systems like this one from Marco Polo are lightweight, waterproof and last for days. That should be plenty of time to find where your drone ended up. Second, most drone losses will occur when you're flying beyond line of sight. When you can't see your drone, you can't spot obstacles outside the vision of your live feed, which is not wide enough to navigate safely or offer a complete awareness of your surroundings. This is also the case if you're flying with FPV goggles. Consider flying with a spotter beside you when possible to help keep track of your location. Third, be sure to calibrate your drone properly before take-off and avoid flying in areas where there is interference. This includes setting up your return to home function so to ensure the home point is in a suitable location and the returning altitude is high enough to avoid obstacles on the way. Finally, it's much easier to end up with a lost drone when flying in the dark or low visibility. If you are Part 107 certified and have obtained a waiver to fly at night, make sure you use appropriate lighting that will keep you and others aware of exactly where your drone is at all times. Although things can occur way beyond your control, a lost drone often happens due to pilot error. Check out our 'Where to Fly' list for more information on how to stick to the rules and keep your drone safe, and our pre-flight checklist for more information on setting up your drone for a successful flight.